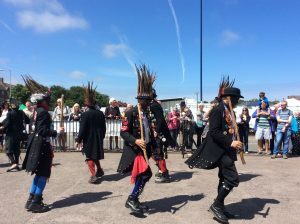 The weekend of 1 -2 July 2017 saw the little Norfolk Town of Sheringham bustling with folk dance performances. 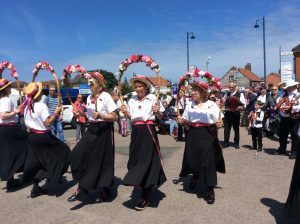 It all started in the 1990s, when the local Morris Dance group the Sheringham Lobster Potties started an annual festival with just a few visiting sides (a Morris dance group is called a ‘side’). 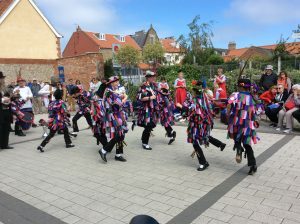 The Lobster Potties started in the 1980s and performed the traditional Norfolk Morris style around the UK and Europe. They chose the Lobster Pub as their headquarters, and as Morris dancing is considered by some as ‘potty’, the choice of the name was obvious! In 2013 the Lobster Potties disbanded due to the lack of dancers, but a committee was formed to run the festival. This 24th festival featured 40 folk dance sides, showcasing different styles and parts of the country in many locations around the town. 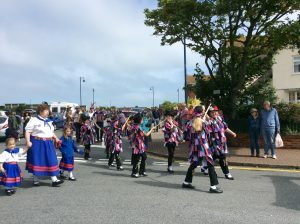 The festivities kicked off on the Saturday morning with a parade of all the sides dancing through the town, with the captive audience lining up the streets. Then groups moved from one location to another, each side taking it in turn to dance. 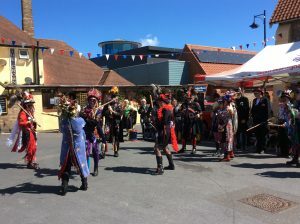 The festival culminated in the mass show in the main arena – the square in the town centre, with all the sides performing one dance for the final time. Splendid time was guaranteed for all! The sea side town of Sheringham lies in the middle of Norfolk coastline. Its story is typical for hundreds of coastal towns around the British shores. It is likely that there was a little fishing village there in the Anglo-Saxon times, and when the Vikings came to settle here in 900s, they gave it their own name – meaning ‘The Ham of Scira’s people”. Scira might have been their leader in battle. Viking longboats, perfect for the rough North Sea, proved excellent for fishing, and for the next few hundred years Sheringham fisherman built their own fleet of sturdy open broad boats, pointed at both ends, for catching grab, lobster and whelk. A community of blacksmiths, fish merchant, rope and sail makers and other tradesmen grow steadily, culminating in about 200 boats working on the beach here by the beginning of the 20th century. Bigger boats, manned by up to 12 people, sailed as far as Iceland. Fisherman’s wives and daughters were closely involved in the family business, ‘dressing’ crabs, mending sails and ropes. The arrival of railways in 1887 boosted the fishing industry, enabling Sheringham fisherman to become major suppliers of crabs and lobsters to the London fish market. At the time Sheringham was served by two railway lines, The Midland and Great Northern from the West and the Great Eastern from the East, making it possible to get to London in just over 3 hours (not much change there this is how long it took us to drive from London last weekend!). This gave rise to the new industry in Sheringham, which gradually replaced its fishing – the holiday makers paradise. Today it is a perfect location for a family sea-side holiday, with picturesque walks in the nearby Sheringham park, run by National Trust, cliff walks, Blue Flag pebble beach with multi-coloured beach huts on the promenade. A number of festivals are held throughout the year, including our special favourite Potty Morris and Folk Festival. The town’s history is celebrated in the Mo Museum, which tells the story of the local fishing and shipbuilding industries, historic life boats and the life of its people through the ages, as well as a geology section, featuring 1.5 million year old elephant bones, found locally among the fossils. The museum incorporates Sheringham Shoal Wind Farm Visitor Centre – you can see the wind mills going round far away in the sea on a clear day. Most of Sheringham’s houses come from the end of 19th/beginning of 20th century and many are decorated with flint, found in abundance on the local beaches. Sheringham does not have a harbour, so the boats have to be dragged on and off the beach. This also means that the coastline is vulnarable to the rough weather and erosion, so in the 1970s the coastline was re-inforced to strengthen the coastline in front of the town: a concrete sea wall was built, which also serves as a promenade, and a series of groynes, reinforced at the base with huge blocks of natural stone. Sheringham shares with Great Yarouth the dubious claim to fame of being the first in England to be bombed by the German Zeppelins during World War I – and incendiary bomb hit a cottage in Jordan’s Yard, Windham Street in the evening of 19th January 1915. It did not explode, so no one was killed. The second bomb, dropped in Priory Road, did not cause any fatalities either. English composer Ralph Vaughn Williams first visited Sheringham in 1905, when he was visiting Norfolk collecting folk songs. He wrote down a couple of tunes – from a railway worker and at a local pub. In 1919 Vaughn Williams and his wife lived briefly at Martincross, a large house on The Boulevard, where he wrote his Sea Symphony. As a summer holiday resort at the turn of the last century, Sheringham attracted polar explorers Scott and Shackleton, and Sir Arthur Conan Doyle, who based The Hound of the Baskervilles on the legend of North Norfolk’s ghostly hound, Black Shuck.